You think the Xband for Genesis & SNES would work? Are you doing this through the same method to get Dreamcast Email? And lastly I've been still researching every weekend to find a solution to bring Saturn NetLink to life without having to buy a traditional Land Line. I've been reading up on V.MOIP http://www.voip-info.org/wiki/view/ITU+V.150.1 which I think would allow NetLink to work over broadband, but I guess companies haven't implemented this yet. Of course ideally it would be nice if we could connect ras pi's together like we do with dreampi and provide a solution that way. I think it will take reverse engineering how Netlink connects to other Saturn's then emulate that with a pi. OR, make a software version of how a phone line simulator works that would be able to connect to others via IP Addresses. Xiden wrote: I've been researching a solution for a "Saturn pi" but its something we'd have to code out. Unless someone knows of some "Virtual Telephone Line Sim" software. From what I've seen, when people use Digital Phone Lines there are two issues. 1. Delay in the service, 2. Receiving Data Packets out of order. To me, seems like we'd need to take the modem commands from one Saturn and store it in a file, send it to whatever IP is Hosting and have that file read in the correct order back to the other Saturn. But I don't have a deep understanding on how dial up modem tech works, or if I'm even on the right track. Basically the way I see it maybe working is where one person enters in a IP Address as a "Phone Number" of the person you are wanting to play against, then the PI takes the IP + Whatever Data for the game -> Sends to other persons Saturn and vise versa. That some next level thread concurrency you want there haha. Honestly, I don't think it's impossible. The hardest parts about this sounds like it'd be the interface parts. I'm not saying it'd be easy, but not impossible either. I use an unlocked Linksys PAP2T for my Dreamcast. It is a VoIP adapter that I use as kind of a intercom. When configured correctly it can be used as a cheap phone line simulator to call my Netopia for getting online. The cool thing about this is that it can also be configured to call an IP address over the internet without the need for a VOIP service provider. So as long as you know the persons IP address (who has another PAP2T) you could theoretically use it for online Net Link games. It could also be used to system link 2 Saturn's together locally. The same way as I use it to call the Netopia from my Dreamcast, it could just simply call another Saturn with no additional hardware. 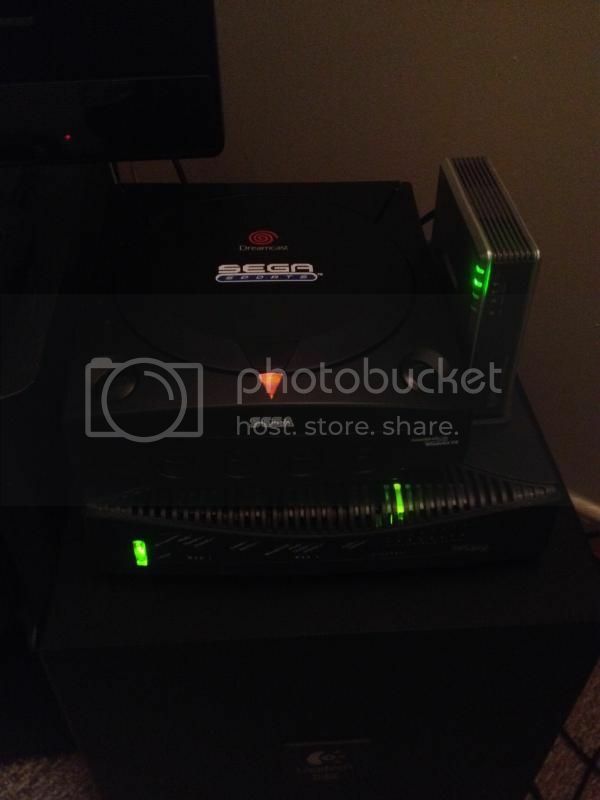 -drez01- wrote: I use an unlocked Linksys PAP2T for my Dreamcast. It is a VoIP adapter that I use as kind of a intercom. When configured correctly it can be used as a cheap phone line simulator to call my Netopia for getting online. This sounds exactly like the solution we need. I think I might invest in one of these and then we should try it out to see if we can get some Netlink games going! Sadly I do not own a Saturn or I gladly would. Maybe someone here has the hardware to help in the testing of Saturn's peer to peer Netlink connection capabilities with the PAP2T. When purchasing one make sure it is unlocked. If not it will be unusable for this as it will be locked to a specific VoIP service provider. I got mine via eBay from China for $25 with free shipping. Unfortunately any sort of VOIP solution likely won't work. It's been tried before with NetLink without success. Apparently it's because of the latency which is double that of a traditional analog phone line making games just about unplayable if you can even keep a connection in the first place. I haven't actually tried it myself but I'm just going by the numerous forum posts I've seen online on the subject. lets hope that soon we can revive the netlink! pcwzrd13 wrote: Unfortunately any sort of VOIP solution likely won't work. It's been tried before with NetLink without success. Apparently it's because of the latency which is double that of a traditional analog phone line making games just about unplayable if you can even keep a connection in the first place. I haven't actually tried it myself but I'm just going by the numerous forum posts I've seen online on the subject. True thats what V.Moip is supposed to solve. Timing + Compression of data is apparently the root cause. V.moip also compresses but uncompress and reorganizes the data properly and feeds it to the analog modem. Pretty much if we can capture netlink data, store and send, and unpack back to the opponents netlink, that should be the key. If we direct IP connect plus send the data uncompressed in correct order I think that would work. Bypassing a voip company with an unlocked device and maybe using ATA adapter might work. Not even sure if an ATA would be needed. Saturn VOIP _other_ working modems?? DreamPi Settings For Saturn NetLink?